One of my favorite Bible verses is Philippians 4:13....so of course I had to use it when I saw it was part of the set for the Stamp of the Month Challenge! Today is the Mid-Challenge Inspiration over at Kitty Bee Designs Aloha Friday Challenge for our challenge #26 - Fairytale & Fantasy. Our sponsor is Meljen's Designs and I was able to use the image called Over the Moon. By the way - there's a sale going on over at Meljen's (ends July 4th) so it's a great time to stock up on some really great and fun images!! Come on over and join us at Kitty Bee Designs Aloha Challenge!!! I'd love to see your Fairytale & Fantasy creations!!! It's Sunday which means it's time for new releases at Digistamps4Joy! This week's releases are soooooo cute!!! I was able to use "Selena" and she's just adorable!! I colored her with Spectrum Noir markers and used an embossing sheet that was sent to me a while back in a swap. The flower centers of the embossing sheet screamed to have some bling so of course I had to give in - LOL!! Thanks for stopping by today!!! Be sure to head over to Digistamps4Joy and check out the other new releases....as well as the eye-candy from the Design Team! God bless you!!! It's a another bitter sweet day for me - today is my last post as part of The Crafter's Cafe Challenge Design Team. I've enjoyed being part of this wonderful group, but time constraints have meant that I have had to say goodbye for now. But I'll be back to participate in challenges! The image is called "Train" from our sponsor, QKR Stampede. The embossing layer was sent to me and I "distressed" it with some darker ink to really bring out the steel plate feel. I then went over it with sandpaper to give it and even more "distressed" feel. I also went over the image very lightly with that same ink pad. Thanks for stopping by today!!! God bless you!!! It's hard to believe another month has come and gone and here we are - time for my DT Spotlight. This weekend is Father's Day and I have a friend who is about to become a new daddy so a baby card was in order. I used "Super Hero Panda" - cause it's just a cute image for a baby card and because my friend is certainly going to be a Super Hero Dad! Stop on over at the Kitty Bee Etsy shop to see what fun images are there - I know you'll not be able to be there without saying "AWWWWWW" and "I want that!" at least once! Enjoy your weekend!!! And Happy Father's Day!!! God bless you and thank you for stopping by today! Today is a sad day for me. This is my last post being part of the Pattie's Creations Design Challenge DT. I so enjoyed my time there and thank Pattie so much for giving me the opportunity! But with time constraints I just felt it was time to step down and give someone else a chance to be part of such an amazing team!!!! The new theme at Pattie's Creations Design Challenge is "Father's Day or Wedding" - it's your choice! Now what could be more perfect for June? And as always, there really is only one rule for the challenge - besides keeping with the theme - you must always use an image and it can be either digi or traditional stamp. Now how easy is that? For my card I used Pattie's image called Mens Tie Trio. My plan was to cut out all three ties...but that didn't work out to well because I have a "helper" when I craft who wants to put his paws all over everything (yes, my kitty helps me). So after cutting one out I decided to just use two of the three. I really liked the fact that you can use either one or two or the whole image - it makes it so versatile! I colored them with markers and then used a Sissix embossing folder to emboss the base of the card. Inside is a Bible verse and the third tie. Oldie But a Goodie - Father's Day/Masculine (the paper and buttons are at least a year old - probably older! LOL!! Thanks for stopping by today! Have a very happy Father's Day and God bless you!!!! 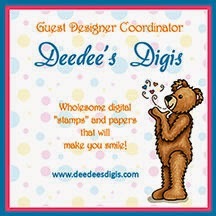 "Flowers, Flowers, Flowers" is our new theme over at Digistamps4Joy...who doesn't love flowers! I certainly love them! And I'm always so impressed with those who have beautiful gardens...but me? Nope, I can't even keep a fake flower looking good. LOL!! Ah, but I do appreciate them and since I'm not the gardener, I can at least include them on cards right? This week I used an image called Serenity She's so beautiful and I love all the flowers included in the image. As soon as I saw the image I knew immediately what paper I wanted to use! I've had this paper for a while and have never used it....not eve sure where it came from to be honest. The center of the flowers are dots of Liquid Pearls. Again, this is something I've had for - gee, probably 5 years - and have never used. I just never knew what to do with them. But I love the pearly look and the texture it gave. Thanks for stopping by today! God bless you today and throughout the rest of the week!!!!! Gee, if you're a follower of my blog you've hit the jackpot the last two days! LOL!! Today I have news of ANOTHER freebie! This time it's over at Deedee's Digis. Why another freebie? Well, it's to celebrate the jump in the number of "likes" at Deedee's Digis Facebook Page. Head on over to the shop to pick it up - it's called Handmade Happiness. I think it's adorable and can't wait to play with it myself. While you're over at the shop - you can also pick up this months featured stamp set for the monthly challenge. 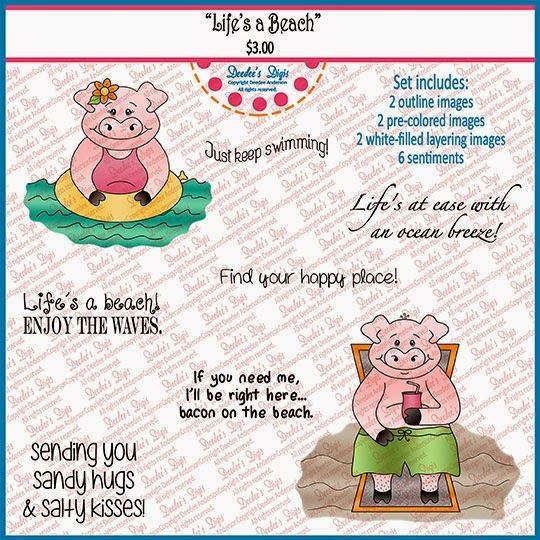 What could be better for summer than a pig on a beach? LOL!! I love this little guy and couldn't wait to not only make a card with him....but put that in an envelope and send him on his way. Yes, right now he's on his way to Florida. And what a bargain too because since this is the "Digi of the Month" it's on sale for $1.50...and if you purchase it and play along - this month then you will get next month's Digi of the Month for FREE! See, I am just the fountain of info for freebies! LOL!! Thanks for stopping by today! God bless!!!! Now who doesn't love Freebies? I sure do!!! And I have one to share with you today!!! 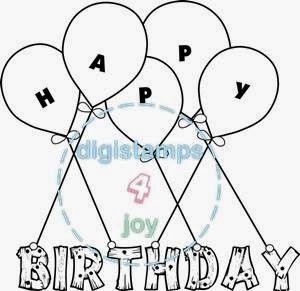 Digistamps4Joy has a wonderful image available for FREE called "Happy Birthday (mp333)". This image is perfect for any Birthday card you have to make or even for a scrapbook layout....or any other papercraft project you may have. The Freebie is only available in the shop for 3 days so hurry on over and grab it. You will need to set up an account in the shop (that is free and very simple to do) and then add the image to your card. At checkout it will be completely free! Not sure you want the freebie? Well you'll have to just check out the beautiful work over at the Digistamps4Joy blog to see how many different ways this image can be used! Be sure to pop on over and pick up the freebie.....and check out the other great digis in the shop too! I don't know what made me think about cutting out some of the diamonds but I like the way it turned out. Thanks for stopping by today!!! I hope to see you at The Crafter's Cafe. God bless you!!! Today is Sunday which means it's a new release day at Digistamps4Joy! You should see the great new releases!! 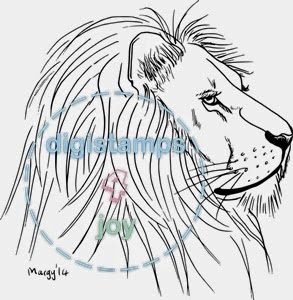 One of them is this fabulous lion drawn by Margy. I just love animals and as soon as I saw it I knew I had to play! Amazing that I seemed to have the perfect paper to go with it too...didn't even know I had it! LOL!!!! I colored the image with markers and then added a couple buttons that a friend had sent me a while back. They are made from coconuts and gives that more natural feel since a lion is all about being outdoors in the open majesty. Come on over to Digistamps4Joy and see the other lovely new images....as well as the HUGE store full of anything you would ever want.